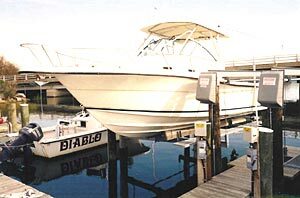 Oldest most proven design, powered by two worm gear driven winches, allows you to raise your boat further out of the water which is especially important during adverse sea conditions. 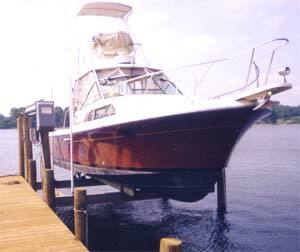 The tie in of the overhead beams to the pilings gives additional support to the lift systems, adding to the quality. 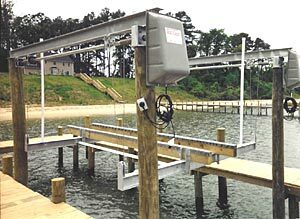 Our overhead beam boat lift systems give strong support for your boat while giving a conventional look. 4,000 lbs. to 16,000 lbs.